Throughout Auburn’s history the spirit of utility, adaptability and camaraderie has held strong. Never one to sit idly by while the world—our global community —stands in need, the Auburn Family has remained committed to innovating solutions for lingering problems. For the last 162 years, it has served us well. On March 29, 2018, the institution entered a new chapter, one that will see Auburn’s abilities amplified like never before. 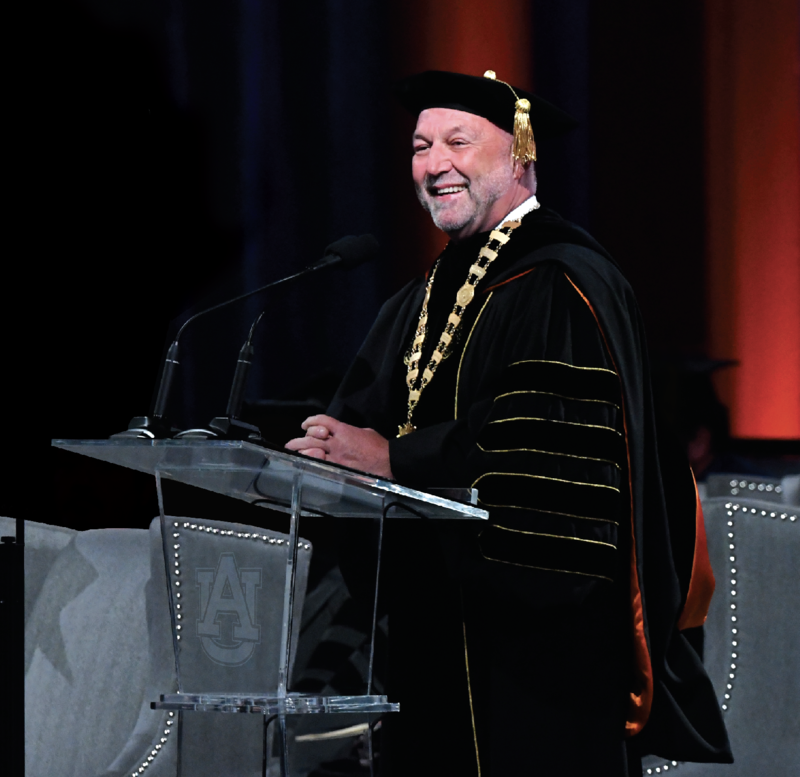 On that day, Dr. Steven Leath, the nineteenth president of Auburn University, formally delivered his vision not just for the next five years, but the next 50 and beyond. All three points are in service of a single, unified goal: achieving R1 Research University status from the Carnegie Commission on Higher Education. Currently listed as an R2, a leap to the top echelon would put Auburn in the same company of universities as MIT, Stanford and Johns Hopkins. The benefits, Leath says, would be endless: public and private companies using Auburn for research and development; broader, in-depth experience with real-world organizations for students; funding for new facilities and programs; graduates’ improved marketability for careers and opportunities in their field; increased internship opportunities; avenues to create intellectual property, which could be reinvested into the university and more. Leath is no stranger to helping things grow. A plant pathologist by trade, he built his career studying plant diseases and plant breeding, publishing nearly 100 articles on his research and following in the footsteps of his father, Kenneth Leath, a respected plant pathologist and professor at Penn State. Following the completion of his undergrad at Penn State, Leath attended the University of Deleware, earning a master’s in plant pathology and meeting his fiancé Janet in the process. The two were married in 1981, while Leath earned his doctorate from the University of Illinois’ Urbana campus. Coincidentally, years later, while touring the Plant Pathology and Entomology facilities at Auburn, Leath was surprised to learn that Kira Bowen, John Murphy and Ed Sikora, three of his colleagues from Illinois, are all on the faculty here. In 1985, Leath accepted a residency with the UNC Agriculture Research Station (UNCARS). After moving around so much, Steven and Janet would stay in North Carolina for the next 27 years. Today, it’s still where they call ‘home.’ It’s where their sons Scott and Eric were born. It’s where they still maintain a home and Christmas tree farm in Jefferson. It’s also where Leath would rise from a plant pathologist with the UNCARS to VP of Research for the UNC System. Comprising 16 separate constituent universities and a high school, including five minority institutions, four historically black universities, one Native-American serving institution and a variety of public, private and liberal arts colleges, the UNC System encompasses a wide breadth of institutions. Leath still takes pride in never trying to homogenize them, allowing each school to develop its own identity while still remaining committed to the same mission. Though he technically worked for Erskine Bowles, Leath reported directly to Senior VP for Academic Affairs Harold R. Martin. A former Chancellor of Winston-Salem State and current Chancellor of North Carolina A&T State, Martin remains a close friend and mentor to Leath. At the time, Leath aspired to make the transition from vice president of research to university president or chancellor, but admits he thought he needed more experience. Martin was the one to convince him he was ready. When Iowa State University eventually hired Leath as president, he arrived with high expectations for himself and for the school. In five years, Leath’s administration expanded research funding, raised student enrollment and retention rates, updated the school’s research park and became the largest public university in the state. Though he had achieved much, Leath wanted to do more. Then, in 2017, when President Jay Gogue retired after a decade in office, the presidency was offered to him. For Leath, it was a dream come true. Leath met with Auburn Mayor Bill Ham, made the rounds of every college on campus and met with students to discuss their biggest concerns, assessing Auburn’s strengths and isolating several key milestones on the path to becoming an R1. Complicating things is the abbreviation of Carnegie’s evaluation period from five years to three. Basically, Auburn will be evaluated on the progress made between 2015 and 2018. To sharpen his administration’s focus, Leath is hiring two separate VPs—one for research, the other for economic development—to concentrate all their time and energy on advancing the mission. A stated goal of his administration is to employ 500 research faculty members by 2022. Leath has stated before that the strength of a university rests as much with its faculty as its facilities and encourages them to propose the fields and projects to pursue. 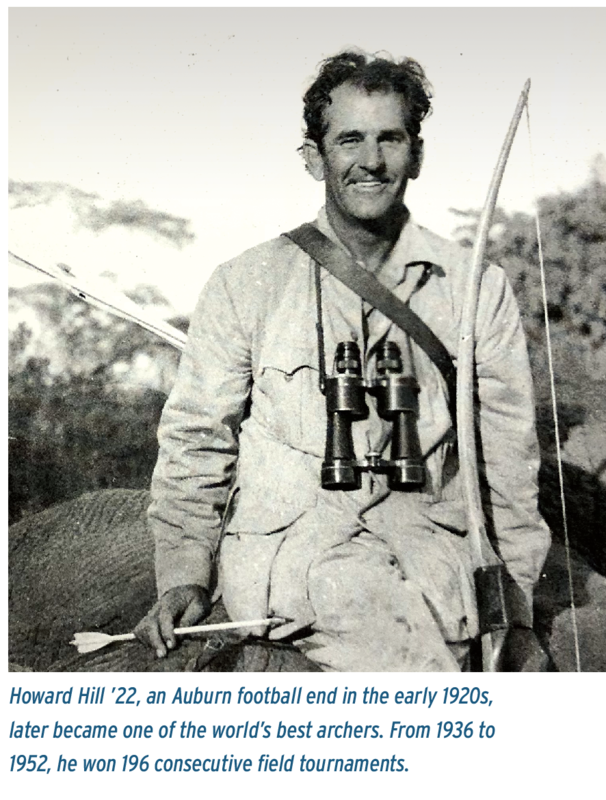 It’s hard to be an expert in every field, he says, but fortunately for Auburn, we have experts in every field. Leath points to our world-renowned aquaculture program, first-rate additive manufacturing program and burgeoning partnerships with Delta and NASA as examples of Auburn’s solid foundation, but says that if we’re going to reach the top level, more facilities and more researchers are necessary. But Auburn’s research campus isn’t the only that needs an update. Leath mandated a revision of the old, transaction-driven research partnership model to a more flexible design like the one used by the North Carolina System and Iowa State. The goal is to build long-lasting partnerships that Auburn can rely on moving forward. Auburn has plenty to offer potential partners—students, research facilities, a steady supply of interns, graduate workers and faculty—with room to grow in other fields, like biomedical sciences, cybersecurity, music performance and more. Advancements will not be limited to purely “bench science” either; Leath envisions a host of upgrades in the humanities, as well as an “arts district” centered around the Jule Collins Smith Museum of Fine Art and the Gogue Performing Arts Center to be completed in 2019. As the Auburn Research Park expands, Leath hopes that there can be collaborations between the arts, humanities and other fields like engineering or business that could generate value from intellectual property which, in turn, could be reinvested in Auburn. Leath isn’t the only one taking the initiative in humanities advancements. Janet herself has been a driving force for change, always concerned and committed to helping disadvantaged youths in the community through fundraising and after-school programs. In Ames, Iowa she served on the board of the Youth and Shelter Services; since arriving in Auburn, she has joined the Lee County equivalent, as well as joining the fundraising committee for the Gogue Performing Arts Center and the eventual “Arts District” coming to South College Street. It was, at her suggestion, that Langston Hughes’ poem “I Dream a World” was performed to music by professors Rosephanye and William Powell during Leath’s installation. There are no cut-and-dry numbers Auburn needs to achieve R1 status—Leath compares the selection process to the NFL draft, ‘try your best and hope you’re picked well’—but is confident that Auburn has a very good chance already, and that mobilizing the university for the selection process will only benefit the institution moving forward. Critical to success, however, is the support of the entire Auburn Family. 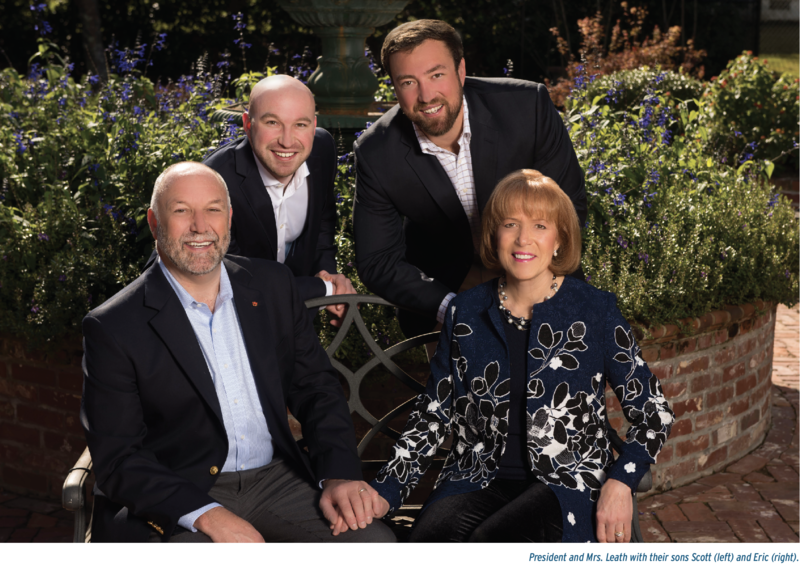 With more than 230,000 alumni around the world, Leath hopes that alumni young and old can advocate for Auburn and its programs. A look around Auburn today provides a clear demonstration of that growth. Inside the Auburn Research Park new facilities for health sciences, childcare and administration are already breaking ground. Dining, residence options, parking and other amenities to sustain future generations are already in the works. One hundred individual grant proposals for the recently created Presidential Awards for Interdisciplinary Research Initiative were submitted earlier this year. With new developments, initiatives, partnerships and more happening every day, there’s never been a better time to make the push for R1 Research University status than right now.